Are you looking for a gothic horror costume for Halloween 2012? Why not try choose Edgar Allan Poe, the horror novelist and poet who died in mysterious circumstances. John Cusack plays Edgar Allan Poe in the Raven - a gruesome fictionalised version of the days before he died. Poe also pops up in Abraham Lincoln Vampire Hunter. Let's put together an Edgar Allan Poe costume. So what does Edgar Allan Poe wear? Poe died in 1849 and the movie The Raven takes place in the last days of his life. This was the Victorian era, when gentlemen dressed formally. In the movie Poe wears a frock coat, a fancy waistcoat and a cravat. In some parts of the movie Edgar Allan Poe is very clean and well-turned out. But as events take a turn for the worse his appearance becomes more dishevelled. Poe wore the clothing of an 1840s gentleman. Clothing was in the formal Victorian style. 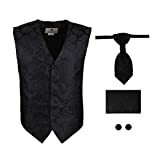 You'll want black pants (a pair you already own will be fine - this isn't the key part of the costume) and a long period frock coat. Ebay is a good place to look for a period black frock coat. Any black overcoat or long suit coat with lapels will do if you want to keep the cost down. You'll want to add a fancy silk or brocade vest and a white collarless or banded collar shirt. You could just cut the collar off an old work shirt and be close enough. Most of the shirt will be covered by the vest anyway and you'll probably be keeping your jacket on. The vest is a key feature though - Victorian men often wore their coats open to show off their vest or waistcoat. 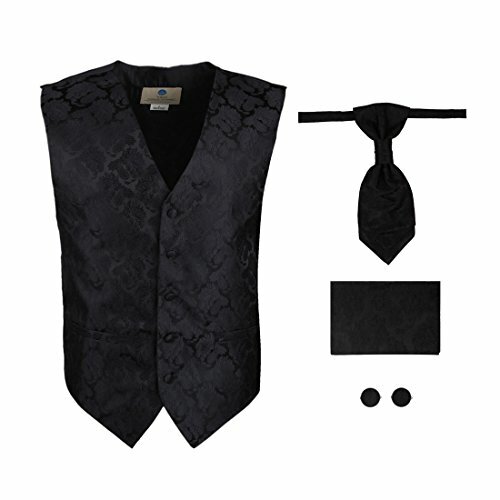 Find a black silk or brocade vest on eBay. In The Raven Edgar Allan Poe wears a Regency Ascot cravat. This is a wide, full cravat where you see lots of the material. in the trailer we see both black and cream cravats. Find an Ascot cravat on eBay. John Cusack's Edgar Allan Poe has a brown goatee beard, with a chin patch and a moustache. The most effective option, if you have the right coloring, will be to grow your own Poe beard and moustache for Halloween. If you don't fancy growing your own then a stick on pirate or rogue beard is probably the closest you can get. You'll need to trim off any beads or plaits to get the Poe look. Now we want to make sure this is obviously an Edgar Allan Poe costume, not just any Victorian era gentleman. For this we can add a raven. 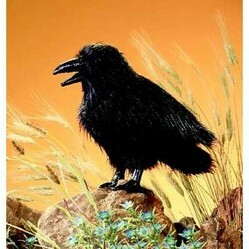 The Raven is the title of the Edgar Allan Poe movie that is out in 2012 and of course it's the title of one of Poe's most famous poems. 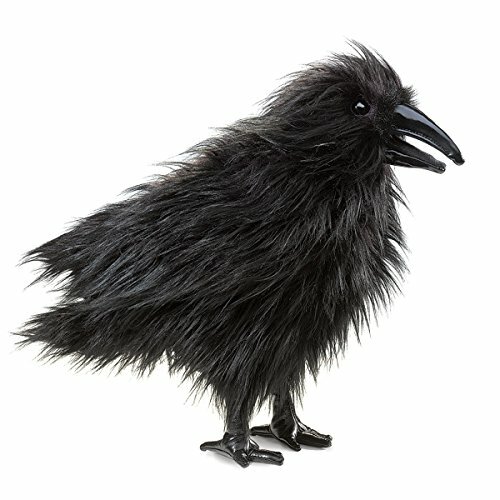 This Folkmanis raven puppet is just right. He's a puppet so you can wear him as part of your costume. If you click on the puppet picture you'll also see a smaller finger puppet version which you could attach to your costume, maybe on your shoulder, or even on your head! A gold pocket watch is another good accessory for an Edgar Allan Poe costume. Men of this era would have worn a pocket watch, but there's more significance to the pocket watch. A gold pocket watch appears in the movie. In the trailer it is pulled from the mouth of one of the victims. That makes a nice gory touch for Halloween! Edgar Allan Poe's fiancee Emily also appears in the Raven. She has a rather gruesome time in the movie so there's plenty of 1800s dress up and gothic horror potential here. Edgar Allan Poe also appears in another 2012 gothic horror, fictional history movie: Abraham Lincoln: Vampire Hunter. Abraham Lincoln and Edgar Allen Poe make great costumes for mates who want costumes that work together. There are plently of other characters from the two movies if you have a larger group. Did you like the Edgar Allan Poe costume ideas?